Miss B: Is dropwines the next Naked Wines? Miss B: What do people say about dropwines? Richard: That we’re wonderful! I had my first fan from ‘The You Tube’ stop me in Victoria Station the other day – very surreal – he came up, shook me by the hand and said ‘Richard… dropwines Richard… yes?’ then proceeded to impersonate me tasting wines. He then disappeared as quickly as he had appeared back into the crowd. Miss B: What’s the story behind dropwines?Richard: We’ve been founded within a hip and thrusting internet business in Camden, whose aim is to improve all things internet. They noticed that buying wine was often confusing and fraught with dangers and not exactly even 20th Century, let alone 21st Century and wanted to make a clear, concise site that offered true value for money, while also being entertaining and informative. We have a small team of six people, who are passionate about delivering the best wine to our customers. Miss B: I can become a VIP of dropwines; what does that mean? Miss B: Do you have a special message for Miss Bouquet readers? Richard: Goodness… Hello? How do you do? I’m Richard. I know about wine, but don’t worry I won’t bore on to you about it, or patronise you, in fact I just want you to drink wine and enjoy it, in fact I’m generally more interested in food, chatting to people and walking my dog Bernie. Oh and I’m single, 35 and have all my own teeth if you happen to be looking! 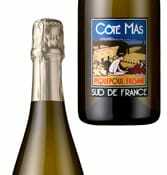 If you’re after a wine recommendation try dropwines’ Côté Mas Piquepoul Frisant NV, an exclusive from the Languedoc in the south of France but hailed as ‘the new Prosecco’ (VIP price £7.92, standard price £8.99) or if you’re just after Richard’s phone number let me know……!